Let me tell you about your favorite new shoe: The adidas Stella Barricade Boost. I’ve been wearing this shoe for about a month and I’ve had the opportunity to play a lot of tennis during that time on hardcourt and clay surfaces. I’m lucky enough to play doubles 3-4 times per week. I do move in and volley a lot, but I did get the chance to check these shoes out from the baseline. Let’s just say that we lost to some really good ladies that forced me to play defensively. That’s not great for my tennis game, but it did give me the chance to check these shoes out in all kinds of situations. I know I shouldn’t care what a court shoe looks like as long as it performs well, but let’s face it: first impressions count! This shoe comes in two different colors: Ultra Bright and Mystery. The Ultra Bright color is somewhere between pink and coral. I would choose this color if most of my tennis clothes were white, gray or black. It could add a pop of color to your feet, but most of my tennis clothes are colorful thanks to the great apparel selection here at Tennis Express! So, I’ve been wearing the Mystery color which matches pretty much anything you throw onto your body. 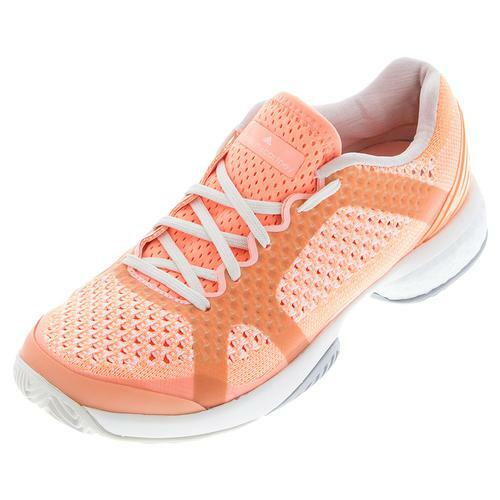 I also love the knit look on the upper of this shoe that makes it look like a running shoe, rather than a court shoe. Don’t be fooled. This Stella shoe is not just a pretty face! It’s perfect for the tennis court for a lot of reasons. 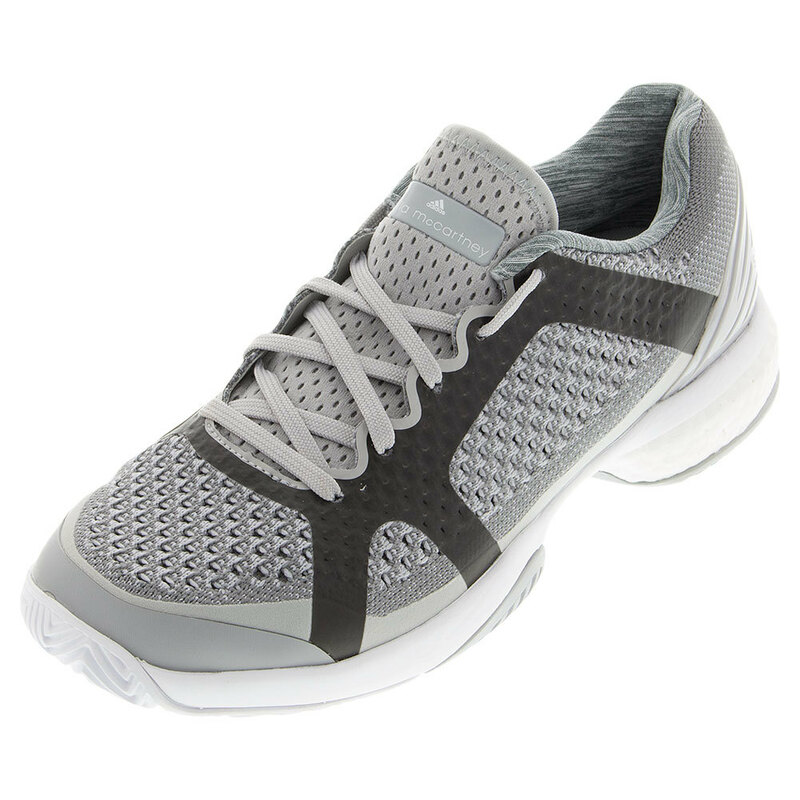 It rates high in all the areas you care about: comfort, quickness, breathability, and durability. Adidas has created a low profile feel for this shoe, even though it has incredible cushioning. You can really feel the cushion all the way from your forefoot to the heel, but the heel is where you get the most bang for your buck. The Boost heel protects your foot from feeling virtually any shock when you move aggressively. I’m telling you that these shoes are so cushioned, I even preferred to wear them on some trail walks we took on vacation. They don’t have as much support as a running shoe, but the cushion is definitely superior to some expensive running shoes I’ve bought. A lot of shoes that rank high on the cushion scale tend to rank low in quickness, but that’s not the case with these shoes. The barricades are responsive immediately out of the box with no break in time. I will say that my feet slipped around a little inside the shoe the first day I wore them around at work, but then my feet seemed to settle into the cushioning which minimized the slipping. By the time I wore them on the court, I didn’t notice any slipping at all. There’s plenty of room in the toe area, so you won’t get that dirty look from your pedicure lady – You know they hate it when you come in with toenail bruises! I was worried when I chose the darker color for these shoes that my feet would feel hot in them. I play outdoors down south and it’s already in the high 80’s on some days, so breathability is a huge issue for me on hardcourt. The knit on these shoes provided plenty of built in air conditioning for me to feel comfortable. I also noticed that I didn’t get a ton of small rocks in my shoes when I played in the clay tournament. Sometimes that can be a problem with shoes that are breathable. 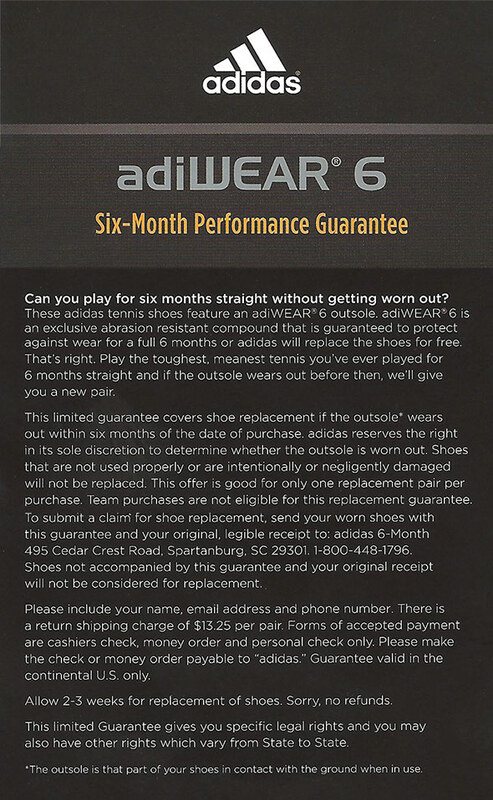 Adidas offers a 6 month outsole warranty on these shoes, so you don’t have to feel bad about spending a little extra for a great pair of shoes. You know you’re not going to have to replace them during the season for excessive wear. Like I said, I used these on hardcourt and clay and I had great traction on both surfaces. I’ve worn them quite a bit and you can see they’ve held up well. If you’re looking for a shoe that’s big on cushion AND quickness, the adidas Stella Barricade Boost is perfect for you! To see more of this summer’s best shoes, read our blog In Tennis Love Means Nothing, Unless We’re Talking About Shoes or visit Women’s Best Shoes if you’re ready to buy!